​As we are stewards of getting our members and friends too and from church...on time and ready for worship. We pride ourselves in safely picking up and delivering our riders back and forth to church and take our ministry very seriously. We have you covered. 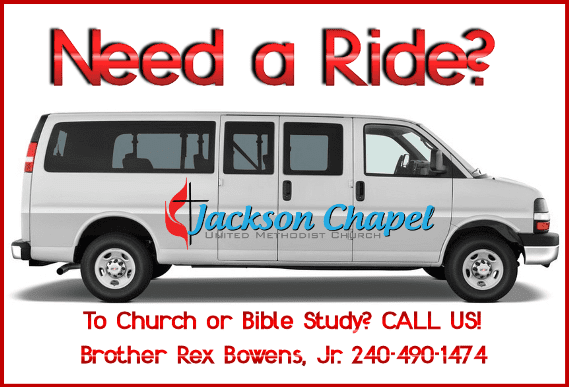 We know sometimes it's hard just getting here, but Jackson Chapel UMC has been blessed with a Transportation Ministry that assists those wanting to attend our services with a much needed ride. We offer transportation to all for both worship services at 8 am and 11 am and for bible study on Thursday evenings at 7 pm. To schedule a one time or recurring pick up, please contact Bro. Rex Bowens, Jr. at 240-490-1474 or email at regoeli0205@yahoo.com to make arrangements. Interested in driving for the Van Ministry? Contact Bro. Rex, Jr. for more information.